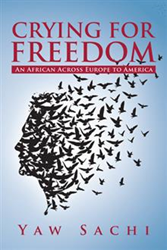 Yaw Sachi marks his debut in the world of fiction with the release of “Crying for Freedom: An African Across Europe to America” (published by AuthorHouse). A seamless blend of history and fiction, this new novel charts a man’s search for identity and belonging in a ruthless and racist world. Inspired by actual events and people, “Crying for Freedom” tells the story of Oheneba, a young man from Africa whose desire to escape his native country's defective social, political and economic systems propels him to Europe and eventually to the United States. He discovers that neither place is the "land of milk and honey" he had dreamt of. His experiences and observations during his travels give way to a thought-provoking reflection on the struggles of the black race and how it might possibly overcome these hurdles. Sachi wrote this book to pass on his gift of learning through experience, hoping that the life story of the protagonist, Oheneba, will engender some change and bring about evolution in the consciousness of his African brothers and sisters and the oppressed minority groups in the world, as well as help with race relations in America. “Crying for Freedom” is a universal tale of self-discovery and mankind’s perennial search for identity and compassion in the midst of the vicissitudes of life. Yaw Sachi is an African-born U.S. citizen and published writer whose professional experience includes several years with a major U.S. international company and a Big Four public accounting firm. He is also a graduate of his company's executive management program. He has an uncanny ability to observe and write about human nature with the thoroughness of an auditor. Yaw Sachi is his pen name.